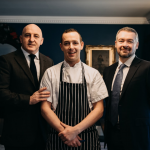 Killian Crowley, chef de partie at Michelin star Aniar Restaurant in Galway, will showcase Irish food at an exclusive dining experience in Tokyo, Japan this month. The event, “Discovery of Identity by S.Pellegrino Young Chefs – New Value in Gastronomy of Two Countries”, will be hosted by the Irish Embassy in Tokyo and will take place on Friday the 11th of January. Killian represented the UK and Ireland at the grand final of the prestigious international S.Pellegrino Young Chef 2018 competition in Milan in June, and will be collaborating with Japanese chef Yasuhiro Fujio who was crowned “S.Pellegrino Young Chef 2018”, to create a gastronomic experience which celebrates both Irish and Japanese cuisine. The collaboration, which is supported by S.Pellegrino, is an opportunity for these young, innovative chefs from different sides of the globe to share ideas, and engage with and learn from each others’ culinary cultures and traditions. Killian, who was born in Belgium to an Irish father and Belgian mother, started his culinary training in Belgium at 15. He worked at a number of Michelin star establishments on the Continent before joining Aniar over three years ago, where the philosophy is for producing contemporary Irish food using local, seasonal, sustainable West of Ireland ingredients. “Discovery of Identity by S.Pellegrino Young Chefs – New Value in Gastronomy of Two Countries” will take place in the Irish Embassy in Tokyo on Friday the 11th of January.